Where available space prohibits the use of a larger dial indicator. Measuring Range Resolution Dial Style w/0 RC Range per Revolution Accuracy Order No. These indicators are normally furnished with continuous dial (with R.C.) or + on right balance dial (w/o R.C. ), lug back, and .18” by .250” long contact. • Size — represents the bezel diameter. Make your selection on the basis of space available for the indicator and the distance from which it will be viewed. Choose the size that offers you the best readability and is the proper size for your fixture. Mahr's "C" size bezels (ANSI/AGD Group 2), which have a diameter of 2-1/4in, are the most popular. represents the bezel diameter. Make your selection on the basis of space available for the indicator and the distance from which it will be viewed. Choose the size that offers you the best readability and is the proper size for your fixture. Mahr's "C" size bezels (ANSI/AGD Group 2), which have a diameter of 2-1/4in, are the most popular. • Range per Revolution — represents the distance the spindle travels with one complete revolution of the dial hand. From the dials available in the size and minimum graduation value you chose, select the range per revolution which allows the tolerance spread to occupy 1/10 to 1/4 of the dial. represents the distance the spindle travels with one complete revolution of the dial hand. From the dials available in the size and minimum graduation value you chose, select the range per revolution which allows the tolerance spread to occupy 1/10 to 1/4 of the dial. 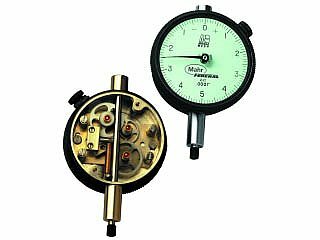 • Total Range — the maximum distance over which the indicator spindle can travel. Usually, this represents 2-1/2 revolutions of the hand, which is adequate for most needs. Sometimes, however, this may not be adequate for your application and a special total range may be necessary. Your tolerance spread is .006in. You have chosen an ANSI/AGD Group 2 (Mahr "C" Size) dial with a minimum graduation value of .0005in. Mahr Inc. offers four indicator types in this size and minimum graduation value. Of these, type C5M has a range per revolution of .030in which is about midway between your tolerance extremes. You selected a C5M indicator. Your total range, however, needs to be at least .200in so the spindle can clear the lip of your part. But, the longest range available in the C5M indicator you need is only .075in. Special ranges up to .400in are available for this indicator type. Select the closest range for your application (for Model C5M, you would select .250in). If the range you need is not listed under the "Special Ranges" category, contact Mahr Federal. Chances are we can supply the range you need. the maximum distance over which the indicator spindle can travel. Usually, this represents 2-1/2 revolutions of the hand, which is adequate for most needs. Sometimes, however, this may not be adequate for your application and a special total range may be necessary. Your tolerance spread is .006in. You have chosen an ANSI/AGD Group 2 (Mahr "C" Size) dial with a minimum graduation value of .0005in. Mahr Inc. offers four indicator types in this size and minimum graduation value. Of these, type C5M has a range per revolution of .030in which is about midway between your tolerance extremes. You selected a C5M indicator. Your total range, however, needs to be at least .200in so the spindle can clear the lip of your part. But, the longest range available in the C5M indicator you need is only .075in. Special ranges up to .400in are available for this indicator type. Select the closest range for your application (for Model C5M, you would select .250in). If the range you need is not listed under the "Special Ranges" category, contact Mahr Inc. Chances are we can supply the range you need. If your tolerance spread is .006in (±.003in), then, the most suitable minimum graduation value is .0005in. Your tolerance spread is .006in. You have chosen an ANSI/AGD Group 2 (Mahr Federal "C" Size) dial with a minimum graduation value of .0005in. Mahr Inc. offers four indicator types in this size and minimum graduation value. Of these, type C5M has a range per revolution of .030in which is about midway between your tolerance extremes. You selected a C5M indicator. Your total range, however, needs to be at least .200in so the spindle can clear the lip of your part. But, the longest range available in the C5M indicator you need is only .075in. Special ranges up to .400in are available for this indicator type. Select the closest range for your application (for Model C5M, you would select .250in). If the range you need is not listed under the "Special Ranges" category, contact Mahr Inc. Chances are we can supply the range you need.